Here are steps to setup and install new VPN client. Download VPN client install file by clicking on this link = Download VPN Client *Please save this file to your desktop. Download configuration file from email sent from Cross Computers, Inc. or your office manager. *Please save this file to your desktop. 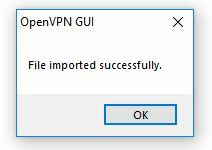 Next, double click on VPN install file (ie openvpn-install-2.4.6-I602.exe in this example). Approve security warnings, accept defaults on install, install VPN adapter on last step and then close the ReadMe file. Under “Look In” browse to desktop. Next, to connect to your office securely. 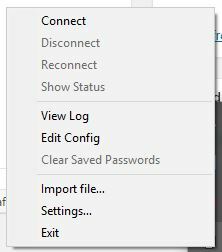 Right click on OpenVPN icon and click on connect. Enter your username and password from your office manager. After connection, you will have access to your company servers and files. If you need help mapping network drives and setting up printers, please contact us for additional assistance.